I am, without a doubt, the slowest writer you will ever meet–not because I don’t know where my story’s going, not because I don’t have plans for the scenes I want to write, and not even because I can’t find time to write. I’m terribly, insanely slow mainly because I have a really hard time getting into THE ZONE. I should clean out my inbox. I don’t have the right playlist. Did I fold the laundry? This desk drawer is full. Let’s clean it out. My bookshelves are a disaster. No but seriously, I should make a new playlist. Wonder what’s going on in the twittersphere today? Next thing I know, an hour (at least) has passed and I haven’t written a word. I am, literally, the worst. Now that I have a book deal and people are actually relying on me to meet deadlines, I can’t afford to work that way anymore. Even without a book deal–none of us are going to get published if we don’t actually FINISH what we’re working on, right? That’s why I love sprinting. It forces me to focus on writing, and push everything else aside. I created #writeclub completely accidentally, but it’s been one of the best motivators for so many people in terms of getting words on paper. Every Friday night, people all over the world (the UK crew starts around Noon EST and the US West Coast finished up around 2am EST) are sitting at their computers, writing under the #writeclub hashtag. We write for 30 minute stretches with 10 minute breaks between them, reporting word counts after each sprint. It’s motivating to see the numbers everyone puts up every single week, and knowing I get a break every 30 minutes gives me time to, say, check Pinterest or iTunes or whatever other silly thing in the back of my mind. Writers on twitter love to have company to motivate each other. You can often find them under the #amwriting or #writeclub hashtags, and there are blogs (such as The Writer Diaries) and groups (such as the 5am Writers Club) that host sprints throughout the week. If you’re struggling to finish your own manuscript, or even just to get started, don’t be afraid to jump in on any one (or all) of the groups you find. If you can’t find one during the time you need it, tweet about it. Ask for help. If you’re looking for company, chances are someone else is too. Most importantly–don’t give up. Remember, everybody works at their own pace. If you’re sprinting and your word count is less than half of everyone else’s, so what? You’re still getting words down. You’re making progress. Every word counts. Besides, you will never ever be slower than me. I promise. 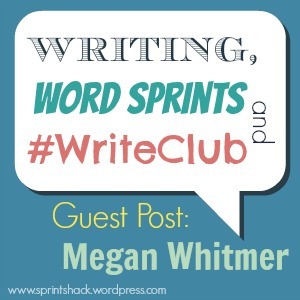 Megan Whitmer is a writer, word sprinter and the creator of #WriteClub. 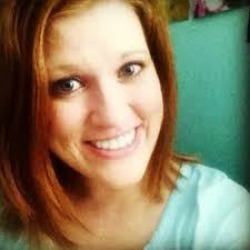 Follow her at @MeganWhitmer and make sure to join in for #WriteClub tomorrow (and every Friday) on Twitter! Learn more about #WriteClub here. Thank you for the fabulous guest post, Megan! We’re very excited to have you on the Sprint Shack! Whenever I take part in #WriteClub, I get so much written and meet so many new and interesting writers. Thank you for creating an event that brings the writing community closer and gives us a much needed boost towards our goals!